Chocolate and coffee or sprinkled with Indian spices? This set of two tins lets you indulge in both. Delicately sweet with the soft chew of baked oats and satisfying crunch of almonds: Granola is inherently delectable for breakfast or even as a midnight snack. As she crafts this special recipe using gluten-free, organic ingredients, Anne Croy recalls growing up on her father's Midwestern farm. "Watching winter wheat being ground into flour, or fresh cream churned into butter, these activities inspire the work I do today," she says. Her set includes two delicious varieties: Kickstart is sprinkled with locally sourced chocolate and coffee, and Midnight Snack has traditional Indian spices like turmeric. Great with a splash of milk, on ice cream, or (our favorite) straight from the tin. Handmade in Missouri. Growing up on a Midwestern farm, Anne Croy is no stranger to delicious, homemade food. She recalls watching winter wheat from her backyard being ground into flour and used for supper. “These activities inspire the work I do today,” she says. Anne’s granola is soft and sweet with a satisfying crunch and surprising flavors like turmeric and coffee. You’ll love it with a splash of milk, on ice cream, or even by itself. But Anne’s work goes far beyond making delectable homemade goods. Her daughter Maliea lives with Usher’s Syndrome, a rare disease that so far does not have a cure. With the help of her granola business, Anne works closely with the Usher Syndrome Coalition to raise awareness and promote research for the important cause. We’re proud to spread the word about Usher’s Syndrome and get Anne’s delightful treat to your kitchen. Each package contains 14 oz. (7 servings) of granola. I bought 5 sets of granola as gifts for family members that we will be visiting out of the US and decided to sample one (Kickstarter) just out of curiosity. Wow! I have never tasted granola so satisfying. Just a hint of sweetness and packed with flavor. The subtle taste of turmeric adds a dimension of flavor depth that I have never found in store-bought granola. My family and I ate this straight out of the canister but this afternoon I had a bowl of nonfat Greek yogurt and strawberries with it. Absolutely a must buy! Rich, sophisticated flavor. 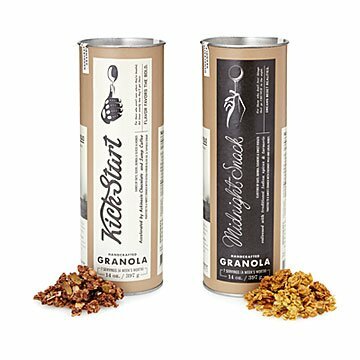 Kickstart is a blend of cocoa and coffee, expensive but perfect for anyone who appreciates trying new foods, great granola, or supporting small business. Would like to see a set offered! Warning: this granola is addictive & you might not want any other granola after trying it. You’ll receive this tasty treat at least a month before the “best by” date. We recommend that you enjoy it soon after it arrives.